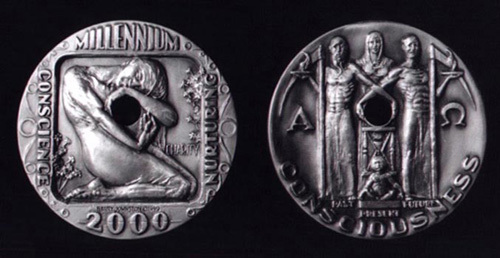 This medal is designed to stimulate reflection by looking at the relationship of "conscience and consciousness." The obverse side, "conscience," is represented by a female figure nurturing the core of her being, her inner world. From her center is born a deep inner knowing or conscience, where lies the heart of human awareness. This circle, also representing the earth, becomes a portal to the reverse side of the medal which addresses "consciousness" -- a greater awareness of our responsibilities to ourselves, others, and the world about us.